Create an interactive tab panel. The Tab Panel component creates an interactive tab panel. You configure the component by specifying the tabs and their associated content, and by configuring the default tab. You can create a more complex tab panel using states. Refer to Horizontal State Navigation for more information. You specify content by creating an H1 for each tab in the Rich Text Editor, and adding content for the tab such as text, images, and tables. 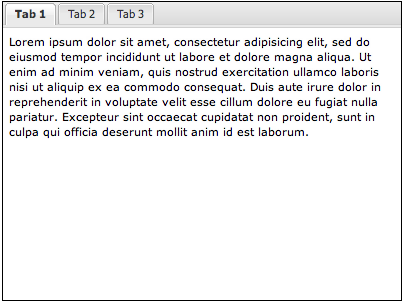 By default, the component includes three tabs and associated placeholder text. Each tab panel must be specified as an H1 using the Heading 1 format. For each tab, you can add any content supported by the Rich Text Editor. Default Tab Index Specify the tab that’s displayed (active) by default. Specify 1 for the first tab, 2 for the second tab, and so on.